10 YEARS, HOW TIME FLYING! 10 years! A lot of things happened, a lot of things past. Thank you very much, WordPress and WordPress.com! Due to the publicly known reasons, this blog at wordpress.com has been not accessible at China for a long time till last Spring festival (Feb.2006). It’s very difficult for me to update and manage this blog, while most of my readers from mainland can not read it since then. So I decide move it to a new site with good performance. Hope you guys can change your bookmark and RSS feeds. I am sorry for the unconvenience for this move. Thanks for the great pleasure WP community gave me. I have a Yahoo Mail account to receive some mailing lists. For a long time I didnot login to check those messages. Today I found it changed outlook greatly, giving me a big surprise. 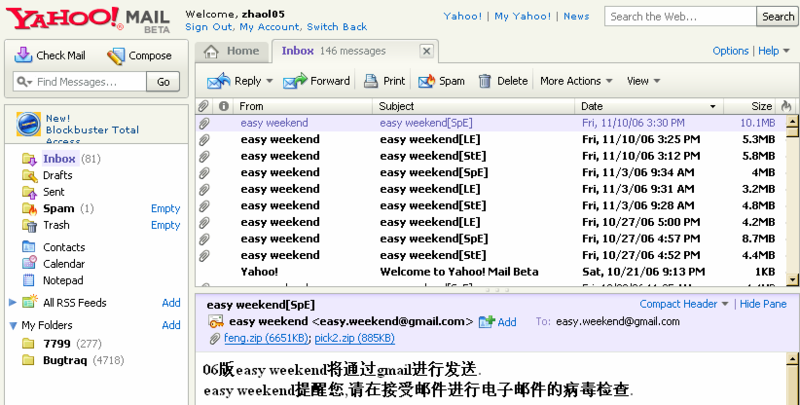 Yahoo Mail Beta, very cool interface. See the below screenshot. I had very different experience with Live Mail beta from Microsoft, slow response, bad interaction, … I felt very upset with it and changed back to the previous hotmail interface. Now go to Yahoo Mail beta. It’s cool. This is the first service not free by wordpress.com. It’s a common sense to regard it as the signal of first step to profit. Considering its huge subscriber base (287 thousands for now), WP is expected to be the superstar at the venture capital market. Here is coming an eye-catching blog at VoIP security at VoIPsa Blog. Will RSS steal away your page view? When we had dinner for CCClub Beijing gathering yesterday evevning, I suggest Billy adding RSS feed to the web site. Billy told me his thinking that RSS might steal away much pageview of the website and thus lower the readers' stickiness. I don't think so. When you prepare to roll out your RSS feed, you must be thinking those feed readers might won't click to the "original page", so that your page view will be eroding. It seems to be a reasonable thinking. But my first question is why you run your web site? second question is why so many web sites are hurrying to advertise their RSS feed? If some of your RSS items always won't bring your subscribers to further clicking, there might be two reasons: your content is just not absorbing enough, and the content is just enough at that moment. For the first case, of course it's not the fault of readers. You need to better your content or they are not your reader objectives, ie. wrong subscription without hurt to both parties. For the second case, you have succeed in getting to your goal : to broadcast your message, why not further waste your bandwidth and adding server load. You lose nothing but those sterile pageviews. Rather, RSS might bring something good that you overlook. RSS feed by far ease the accessibility and readibility. As a result, your message will reach more desktops than just staying at your web site. Buddy, just go RSS. It won't steal your page view and erode your reader stickiness at all. It will do good. Technorati Tags: Rails, RoR, Ruby, "web2.0"